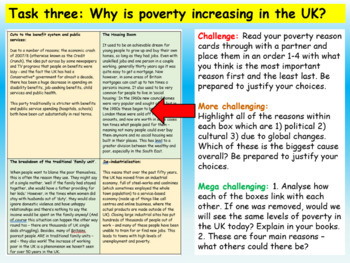 One hour, fully resourced lesson (PowerPoint, worksheets, clip tasks, activities, all differentiated three ways) all about the rising levels of poverty and the reasons behind this. 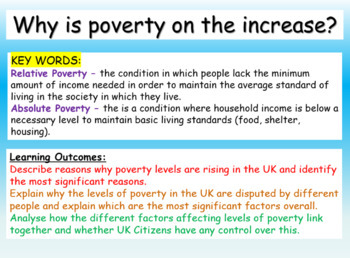 The lesson is adaptable, easy to follow and fully differentiated. 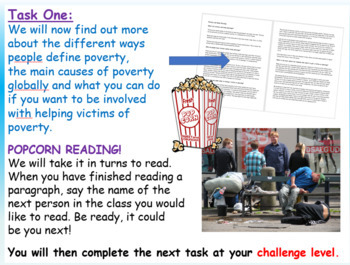 This resource pack includes an hour long PowerPoint with accompanying worksheets, templates, well differentiated activities, literacy focus tasks, clip tasks with three-way differentiated questions and information sheets. 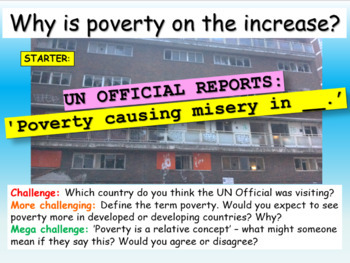 The lesson focuses on poverty both globally and to a larger extent the UK.